On the prowl for the best vacuum for pets? Whether you’re tackling pet hair in the carpet, dander on the sofas, or dirt on your hardwoods, a solid vacuum cleaner is the first step to a cleaner home when you’ve got pets. First in the shoot, we’ve got the Dyson Animal 2 upright vacuum. The Dyson Animal 2 is notably one of the best upright vacuums for tackling pet hair and the other cleaning jobs that go along with cleaning up after a furry friend. It’s large enough to tackle big messes, comes with a 35-foot cord, and the patented Dyson Ball and cyclone technology. High suction power. At 306 AW, the Dyson Animal 2 has the most suction power of any other Dyson vacuum currently on the market. If you have a significant amount of high pile carpet, high traffic areas, or just a lot of pet hair, this increased suction power can be a real difference maker for you. Large dust bin capacity. The Animal 2 upright also has one of the largest dust bin capacities of any upright vacuum. From empty to full, this vacuum can hold up to 0.55 gallons, or around 9.7 cups of dry debris. Comes with accessories. The Animal 2 upright vacuum comes with a few nice accessories that can be useful for pets. It includes a combination tool (crevice tool and dusting brush), a stair tool, and a tangle-free turbine tool. A heavy vacuum. The Dyson Animal 2 is large, powerful, and has a huge dust bin capacity, but that also comes at a price. This vacuum is anything but compact and may be quite heavy or difficult to maneuver for some users. This vacuum is 42” tall and weighs 17.5 pounds. Difficult to squeeze into tight spaces. Again, this workhorse of a vacuum is not really designed to fit into particularly tight spaces. The roller ball does make it easier to make tight turns, but it’s unlikely that it will help you squeeze under furniture. The Shark Rotator True Pet is another powerful upright vacuum. It takes many of the features of the classic Shark Rotator, redesigns the look slightly, includes accessories for pet owners, and brands it as the True Pet model. The suction is listed at 270 AW, which is less than the Dyson Animal 2, but for real-world testing either of these suction levels should be more than powerful enough to clean up pet hair. Lift-away canister. The Shark Rotator True Pet upright vacuum has a lift-away canister that allows you to easily clean difficult spaces like upholstery, stairs, or even spot cleaning automobiles. Comes with many accessories. The Shark Rotator True Pet comes with quite a few accessories, including: under appliance wand, pet power brush, pet multi-tool, duster crevice tool, and an accessory bag to hold all of the parts when not in use. As an added bonus, this model also comes with a washable filter for easier and lower cost maintenance. Lighter than the Dyson Animal 2. The Shark Rotator True Pet weighs 14.5 pounds, making it about 2 pounds lighter than the Dyson Animal 2 upright vacuum. Small dust bin capacity. The Shark Rotator True Pet can only hold approx. 0.26 gallons, or just over 4 cups of dry debris. This is less than half of the dust bin capacity as the Dyson Animal 2 upright vacuum. More difficult to maneuver as a handheld. 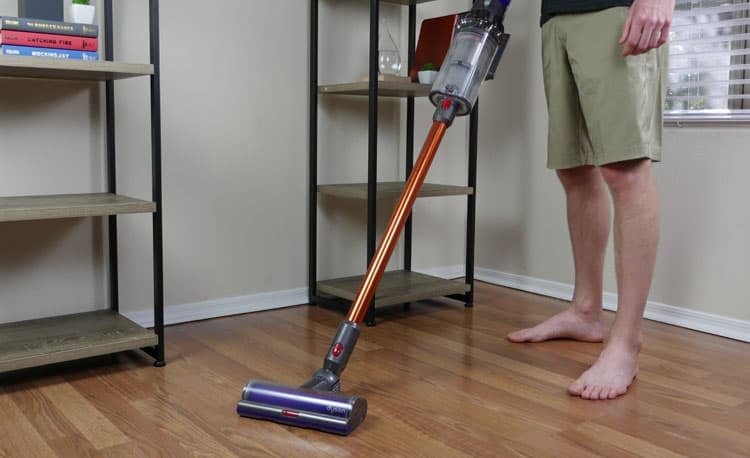 When not in “lift-away mode”, this vacuum can still be quite difficult to maneuver under furniture or into tight corners, due to the sheer size and depth of the overall vacuum. The Dyson V10 is a stick vacuum that quickly and easily converts into a handheld vacuum for on-the-go cleaning. It has cordless power and a suction level of 150 AW on max mode. Now before you discount that as being less than the uprights, take a look at its overall cleaning performance and convenient features. Read our full Dyson V10 cordless stick review here. 2-in-1 body style. The Dyson V10 stick vacuum can run as a lightweight stick vacuum or be used as a handheld, making it a great option for whole-home cleaning or quick spot cleaning on upholstery, stairs, or automobiles. Long run time. This Dyson V10 has up to a 60-minute run time which is twice that of the Shark Pet Perfect handheld and nearly 6 times the run time of the Bissell Pet Hair Eraser handheld. Exceptional cleaning performance. The Dyson scored an average cleaning score of 99% across all floor types. This makes it an excellent option for whole-home cleaning or high traffic areas with variable debris types. RELATED: Like the look of the V10, but want something a little less expensive? Check out the Dyson V8 Animal stick vacuum. This vacuum has many of the same features listed above, but takes a small hit on run time, maxing out around 40 minutes. Smaller dust bin capacity. The nature of a stick vacuum is that it has a smaller dust bin capacity than larger upright vacuums. The Dyson V10 can hold approx. 0.2 gallons or about 3.5 cups of dry debris. This value is not significantly less than the capacity of the Shark Rotator True Pet. High price tag. The Dyson V10 is undoubtedly a powerful vacuum, but it does have a steep price tag. If you’re looking for a better value, you may want to check out the Dyson V8, Dyson V7 or Dyson V6 for less expensive models with the same body style and similar features. The Roomba e5 is the first robot vacuum listed in this guide and offers a few great features for cleaning up pet hair. This model is the best value robot vacuum along the newest launched models – the Roomba iSeries. Read our full review of the Roomba e5 robot vacuum here. Exceptional cleaning performance. The Roomba e5 has a 99% average cleaning performance across all floor types and against all debris types. If you’re looking for a robot vacuum that won’t get caught up with high traffic areas, the Roomba e5 is likely able to handle the job. Long run time. On a full charge, the Roomba e5 can run for approximately 90 minutes, autonomously navigating the area to clean and returning to the charging base when the job is done. Wifi connectivity. You can even pair the Roomba e5 with your wifi network for hands-free control. When connected to wifi, you can start, stop, or schedule a cleaning directly from your smartphone. You can even pair it with a voice control device like Amazon Alexa or Google Assistant and simply use voice commands to get the e5 cleaning. Higher price tag. Compared to the price of even the most advanced upright, the Roomba e5 is more expensive. This vacuum can still be a good value considering what you get, but you have to be a person who places considerable value on the convenience of not having to physically use the vacuum yourself. Limited spot cleaning: If you have a spot that needs specific work or a quick spot clean, it can be difficult to get Roomba to the right area, without placing the robot directly on the spot. And even then, you run the risk of the vacuum leaving before the job is done. Limited accessories. As of right now, the Roomba e5 doesn’t really have any extra accessories that make it easier to clean up pet hair, besides the included dual-rubberized brushroll system which helps to prevent tangles. For another great upright vacuum for pet hair, we’ve got to include the Dyson Ball Multi Floor 2. This upright vacuum is more compact than the Dyson Animal 2, but still has some great features, including a large .42 gallon dust bin (equivalent to about 7.5 cups) and strong suction at 250 AW. Read our full review of the Dyson Ball Multi Floor 2 upright vacuum here. A lighter weight upright. The Dyson Ball Multi Floor 2 is a great option if you’re looking for a Dyson upright, but want something a bit lighter. The Multi Floor 2 is 15.6 pounds, a solid 2 pounds lighter than the Dyson Animal 2 upright. A washable filter. The Dyson Ball Multi Floor 2 has a lifetime washable filter which means less maintenance and helps your machine to run smoother and cleaner. This is an especially nice feature for pet owners. Strong suction. While it doesn’t match the level of suction of the Dyson Animal 2, it is comparable to the Shark Rotator True Pet model. During our cleaning performance tests, the Dyson Multi Floor 2 has an average score of 98% across all floor types and considering all debris types. RELATED: Want something even MORE compact? Check out the Dyson Small Ball upright vacuum which weighs only 12.15 pounds. For veteran Dyson lovers who may be curious, this Small Ball model replaced the DC50, also known as the Dyson Animal Compact. No lift-away canister. If you’re looking for an upright vacuum that can easily convert into a handheld or canister vacuum, you may want to keep scrolling. The Dyson Multi Floor 2 is a powerful upright, but it leaves it at that. Still heavier than a stick vacuum or compact upright. I would consider a lightweight vacuum to be any vacuum that weighs less than 15 pounds and the Dyson Multi Floor 2 comes in just a hair above that. If you’re looking for something ultra-portable and easy to carry, the Multi Floor upright may not be right for you. The Miele Classic C1 is the only canister vacuum included on this list, but it’s included for good reason. This vacuum is a German-made product, with amazing cleaning performance on all floor types, a variety of different cleaning modes, and a bagged debris system. Read our Miele C1 canister review here. Excellent cleaning performance. Whether tested on hardwoods, low pile or high pile carpet, the Miele C1 had exceptional cleaning performance, averaging out around 99% for all floor types and against all debris types. Comes with accessories. The Miele C1 comes with a large selection of accessories, including: hardwood floor head, combination floorhead (for carpets and area rugs), extension hose, dusting brush, upholstery tool, crevice tool, and an accessories clip to carry 1-2 accessories on-board while your vacuum. Bagged debris system. While some users may see this as a disadvantage, bagged debris systems help to contain all of the mess while cleaning and prevents debris from leaking back into the air. If you or someone in your home struggles with pet allergies, a bagged system can be very beneficial. Not very intuitive. The Miele C1 has a quite a few different options and controls, but without text notations, these settings can be a little difficult to understand. You’ll likely need to read the manual before effectively using these settings. Bagged debris system. It Is not uncommon for a traditional canister vacuum to have a bagged debris system, and there’s certainly advantages, but it might not be a perk that all users are looking for. Bagged systems do require a bit more maintenance as well as cost to replace the bags as needed. The Shark IonFlex DuoClean is a powerful cordless stick vacuum with an advanced brushroll that’s great for cleaning pet hair without tangles. It is designed with maneuverability and cleaning performance in mind. IonFlex cordless. The Shark IonFlex DuoClean uses a cordless lithium-ion battery pack. There are two models, the standard IonFlex DuoClean and the IonFlex DuoClean 2X which includes two battery packs, which prevents having to wait for a charge between cleaning cycles. DuoClean brushroll. The DuoClean brushroll is a two brushroll system that has a large soft roller in the front with a spiral bristle brushroll in the back. The combination of both brushrolls helps to capture large and small debris types. Flexible stick. The Shark IonFlex DuoClean implements a technology called MultiFlex designed into the upright stick. This is essentially a flexible hose that joins the top and bottom of the stick. Being able to bend in the middle of the stick allows the vacuum to sneak under furniture or fold in half for a compact storage solution. Shorter run time. Even with a full charge, the IonFlex battery packs are only designed to run for about 20 minutes, the equivalent of the Dyson V6, which comes in at a similar price point. If you have to charge up in the middle of a cycle, plan to wait. It takes about 3.5 hours to generate a full charge. Small dust bin. Depending on the traffic level of your home, the small dust bin could be another disadvantage of the Shark IonFlex DuoClean. The bin can only hold .3 quarts, or a little less than 1.5 cups of debris. The Bissell Pet Hair Eraser is an upright vacuum designed for tackling pet hair. It has a clear XL dust bin, strong suction, and offers five different cleaning modes. It’s a little on the “big and tall” side, but when it comes to cleaning up pet hair, this vacuum performs well. Pet-friendly brushroll. The Bissell Pet Hair Eraser uses a large foam brushroll with short spiral bristles integrated into the design of the roll. This design helps to prevent tangles from pet hair as the brushroll rotates. Large dust bin. The Bissell Pet Hair Eraser also has a large dust bin capacity and can hold up to 1.36 dry quarts, or approx. 6.4 cups of debris. This is one of the largest dust bin capacities that we’ve seen to date. Comes with accessories. If you’re looking for a nice assortment of accessories, you may be interested in the Bissell Pet Hair Eraser, which comes with a crevice tool (with LED light), a pet hair tool, an extending wand with flexible hose, and a tool holder to help stay organized. RELATED: Like the Bissell name, but looking for something small and compact? Bissell offers the Pet Hair Eraser in a corded handheld or a slightly larger cordless handheld. These models can be great options for spot cleaning pet areas and make nice accessories to your vacuum lineup. A little heavy. The Bissell Pet Hair Eraser weighs in at a whopping 18 pounds, which is heavier than most models listed here. If you’ll be lifting this vacuum around a multi-level home or simply struggle with heavy vacuums, the weight of this machine could be a real problem. A little loud. Likely due to its larger size, the Bissell Pet Hair Eraser is also quite loud. At full power, it operates around 81 decibels (at 3’ away). For comparison, that’s louder than city traffic, but not quite as loud as a hair dryer. Average cleaning performance. The Bissell Pet Hair Eraser generally had good cleaning performance, but this was not true across all debris types. On average, across all floor types and against all debris types, the Bissell Pet Hair Eraser scored 85% on cleaning performance. What’s the Best Vacuum for Pets? Depending on what exactly you’re looking for in a vacuum, you may be satisfied with any of these models listed above. But certainly, each model is designed for specific users. Use the quick guide below to help decide which vacuum for pet hair might be right for you and your furry friend. Both the Dyson V10 and Shark IonFlex are lightweight, cordless stick vacuums. The Dyson offers an extended 60-minute run time, but at a higher price tag. By comparison, the Shark IonFlex DuoClean has a shorter run time 11-23 minutes (depending on the cleaning mode), but is also priced at a lower price point. If you’re looking for max suction, the Dyson Animal 2 and Shark Rotator True Pet are both strong contenders. The Animal 2 maxes our at 306 AW (air watts) while the Rotator offers 270 AW. Suction at this level is more than capable of cleaning pet hair from deep within carpet fibers, upholstery, or any other surface where debris and dander may like to hide. If the overall size of the dust bin is a primary concern, a canister vacuum will likely be your best bet. The Miele Classic C1 can hold up to 4.76 quarts, or over 19 cups of dry debris. By comparison, the Bissell Pet Hair Eraser has one of the largest bagless dust bins at 1.36 dry quarts, or approx. 6.4 cups of debris. Still not sure which vacuum is right for you? Feel free to drop us a comment down below or shoot us a message and we’d be happy to help you make a selection. Finding the best vacuum for pets is an important task to making sure your furry friend doesn’t take over your home. Tackle the dander, tackle the pet hair, tackle the messes—these vacuums are designed to do all of that and help you live a cleaner life with your pets.